Eagle Express on Big “I” Markets offers members access to automobile and homeowners insurance through MetLife Auto & Home, Safeco, Progressive, QBE and Travelers. State availability varies. 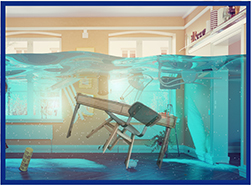 Find out how our new Inland Flood Coverage fills a growing coverage gap and protects home-based business owners against serious losses that can come with a damaging flood. Visit our RLI administrator today. InsurBanc's David Tralka recently had an article published in National Underwriter/Property-Casualty magazine entitled "Wisdom from Agency Owners." In the article, Tralka discusses five key lessons on agency ownership and perpetuation. He shares the wisdom he's heard from agency owners over the course of his career. These lessons can help current and prospective agency owners plan for the future of their agency. The full article can be viewed here. This article was first published in National Underwriter Property & Casualty magazine and is republished here with permission. Copyright© 2018 by The National Underwriter Company, DBA ALM Media, LLC. All rights reserved. Learn more about Insurbanc, the bank founded by and for independent insurance agents, at www.insurbanc.com. If you don't already like Insurbanc on Facebook, visit https://www.facebook.com/insurbanc to stay abreast of financial news relevant to you. It doesn't matter whether your clients are driving a Honda or a Jaguar, a sports car or an SUV. Vehicles today are complex machines. Their lightweight construction and specialized technology add fuel efficiency to the car and help protect your clients and their families. But they also make repairs challenging. After an accident, cars must be repaired precisely, to manufacturer's specifications, to be safe on the road again. Chubb has been insuring cars since they were first invented - everything from everyday cars to high-end, luxury vehicles. They respond quickly and professionally to customers, regardless of whether they're in a small accident or a large catastrophic event. Chubb insists on the highest repair standards to keep customers safe. Chubb has created The Chubb Mobile Estimate app to settle claims within the same day, and they recently created an accident checklist for assistance gathering important information at a time when nerves can be at their worst. Simply stated, Chubb's expertise gives them an advantage over the competition. Over the past five years, Chubb has resolved 100,000 auto collision claims involving complex vehicles. Because half of their fleet is comprised of European cars - known for being more complex - they have the expertise to manage any vehicle repair. Chubb's elite team of Auto Technical Specialists serve as your client's safety advocate by accessing specialized guidance on complicated repairs or hard to obtain parts. They ensure that vehicles are repaired according to manufacturer's specifications, or not at all. Customers can choose a dealership, local body shop or Chubb-approved Masterpiece Auto Preference Services (MAPS) shop for repairs. MAPS shops are pre-certified, based on their skill and expertise, and they guarantee any work performed on a vehicle for the lifetime an insured owns that car. They insist on Original Equipment Manufacturer (OEM) parts, which are designed to work with the vehicle's safety systems. Aftermarket, junkyard or remanufactured collision-damaged parts may not perform well in a subsequent crash. If your clients' vehicle cannot be safely repaired according to the manufacturer's specifications, Chubb will total it. With optional Agreed Value coverage, Chubb agrees to honor the value of a car for one calendar year. If that vehicle is stolen or totaled within that year, Chubb writes a check for the agreed amount, not a depreciated limit. Vehicle values are re-set each & every year the Agreed Value option is chosen. With Rental Car Reimbursement coverage, your clients can rent a car just like the one they own. Rental reimbursement coverage is offered up to $15,000 total, with no per-day limit, and emergency coverage for losses 50 miles or more from home. Chubb offers high coverage limits of up to $10 million for auto liability and up to $10 million for UM/UIM coverage. Your clients are covered for damage to a rental car most anywhere in the world when they purchase a liability limit of $1 million or more. Clients don't even need to have their auto insured with Chubb in order to access this coverage!!! 125 dedicated auto claim professionals are available 24/7/365. Chubb has 3 call centers in the United States and Multinational Claim units are operational in 54 counties, providing assistance to your customers most anywhere in the world. Hear from Angela E. regarding her experience with Chubb when her daughter was in an accident. Complex construction and complicated technology can make auto repairs more challenging and costly, but if your client is insured with Chubb, there's no need to worry. The Chubb Masterpiece Auto Preference Program is available to registered members in all states except auto in HI, KY, MA, NC, SC and VA as those are being placed in the legacy-ACE system. Additionally, NJ auto and NC home business are being written in the Chubb Non-Masterpiece environment. Learn more about Chubb Masterpiece by logging into www.bigimarkets.com and clicking on Affluent Program - New Business. Congratulations to our agent in New Hampshire on an Eagle Express sale of $3,636 in premium!